Welcome to my electronic section. 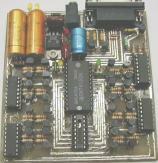 You can find here information about some devices and programs which are related to electronics. Before you do anything, BE AWARE THAT THERE IS NO WARRANTY AT ALL! This means that if you make any damage with devices created from instruction found here, I WILL NOT TAKE ANY RESPOSIBILITY FOR THAT! So if you kill cat, burn a town or destroy an Earth using instructions/programs from this page, you are doing that at YOUR OWN responsibility. Click on image to go to Transformer page. Transformer Calculation is program for calculating number of turns in coils and wire thickness at transformer. You can still use this program to determine size of transformer EI core, especially if you plan to buy transformer. Note there are lots of transformers that are hybrids, so if you need transformer for amplifier buy right sized transformer. Hybrid transformer is ordinarily smaller and under high load can overheat. New version of program is stopped due lack of my free time to make it. See online help under TODO section for more information. Note: All changes and updates on help files are immediately available online and will be included on next program release. Click on image to go to IC Tester page. IC Tester is electronic device for testing ICs (integrated circuits) and may test some others electronic elements with appropriate addon. Device is connecting to parallel (printer) port at computer, currently you can connect it to PC and Amiga computers. All information about assembling and other thins for this device you can find in online HELP at IC tester page (click at image on left). For testing ICs or other elements it's using IC Tester program, in command line which is great for older computers like 386. Of course there is a graphical interface for those who like windows system. Program is supported on PC for Linux, Minix, dos/windows and on Amiga. testing logic ICs 74/54xxx, 75xxx and 40xx see supported file for details. can tell where is problem (if exists) on tested IC. Useful if you planning to use damaged IC for further testing. testing diodes, so far regular and LED, with auto detection and pin orientation. testing OCR elements - Triacs and Thyristors with auto detection and pin orientation. Excellent starting point, you can find here almost anything. A lot of very useful schematics and basic things if you are new in electronics. Do you have problem with finding datasheet or some information data for particularly component?